Contents: Fajita strip sandwich, apple, soup, crackers, chocolate milk, smily face french fries. Fajita strip sandwich? The hell you say? I have never seen a fajita sandwich. Pulled pork, sloppy joes, rib, corned beef, sure, put that on a bun. But fajita meat should be on tortillas only! Infidels! And a chowdery soup with fajitas? 0__< !! 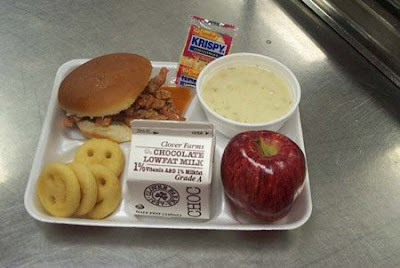 Where is this lunch from? I agree, the idea is quite insulting.